Spring is the most popular time of the year for cleaning. That’s why we prepared for you a spring cleaning list to help you enjoy your beautiful and newly cleaned outdoor area for the whole summer. It isn’t just about cleaning – it’s also about making your home ready to invite friends and family over. More importantly, it’s about making your property comfortable and pleasant for yourself to be in. Here’s how to get the most out of your spring cleaning checklist. Most people never think of cleaning their garage doors, even though chances are they are pretty dirty. Fortunately, garage doors are very easy to clean. Simply put some dish soap in a bucket full of water, and grab a couple of towels. Wash your garage door by hand, just as if you were washing a car. You can grab a stool for the higher parts. Once all the dirt is removed, spray the soapy water off with a pressure washer or hose. Windows can get extremely dirty during the winter. Winter storms tend to leave nasty residues all over the glass. Before you start cleaning your windows, clean the screens first if you have them. Remove the screens and place them on the grass, then gently hose them down. If they are especially dirty, you can rub them with soapy water and a brush. Once you’re done cleaning the screens, move onto the windows. If you clean the outside first it will be easier to tell when the job is done. This is because if you clean the inside first, you’ll probably see dirt on the outside and think that it’s on the inside. Throughout the winter, your gutter has most likely collected a whole bunch of gunk up there. Get on a ladder to remove all of the leaves, twigs, and anything else that has made a home out of your gutter over the winter. The best way to ensure you get everything out is by cleaning it with your hands. Always wear gloves when doing so! 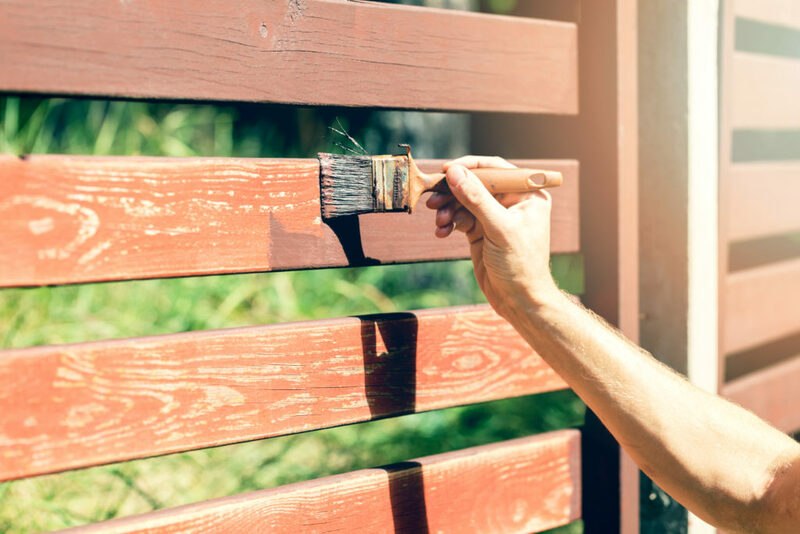 Whether you have a wooden fence or a metal fence, it’s always important to check it now that you and your family will be spending more time outdoors. With wooden fences, always keep an eye out for rot or any loose rails that need to be fixed. With metal fences, check for holes or areas where it’s pulling away from the ground. More often than not, after the snow melts in the spring, homeowners find that their lawn is covered with a layer of soggy old leaves. These remnants of fall can prevent your flowerbeds and lawn from flourishing. Rake up all the leaves and debris from your lawn to let it breathe, allowing new growth to occur. Spring is a great time to yank up any weeds you come across. 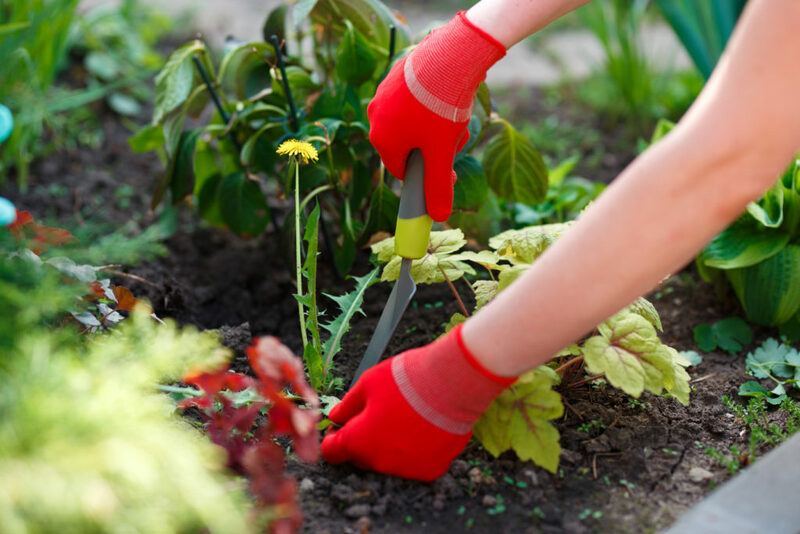 It’s good to remove any troublesome weeds before they have the chance to spread over your entire yard and garden. If you have any overgrown shrubs, try to prune them. When you cut off any dead parts, that makes way for new growth to happen. During the winter, cobwebs can quickly collect outside under your eaves. It’s easy to remove them, just get a duster with a long pole. Walk around the outside of your home, looking under all the overhanging parts. Each time you see any cobwebs in a corner, just remove them with the duster. Once you’re done, you can remove the cobwebs from the duster by rolling it around in a bush. Outdoor furniture can get dirty over the winter. Whether it remained outdoors, or somewhere in storage, it’s not going to be looking its best. If you have plastic furniture, hose them down to remove any dirt or debris that they’ve collected. No one wants to sit down on dirty cushions, therefore you should give them a wash.
You can even invest in vinyl protectants to keep the cushions looking fresh and clean. After a long season of throwing out the garbage every week, your trash cans might begin to stink. Spring is the perfect time to wash them out and get them smelling fresh and clean. Before cleaning them, make sure that there isn’t any trash in them. Then pour some dish soap in each of them. Place the trash cans on their side, and use a pressure washer or hose to clean them out. Leave them to air dry in the sun before putting any trash in them again. Now that the weather is warmer, it’s the season for grilling again! 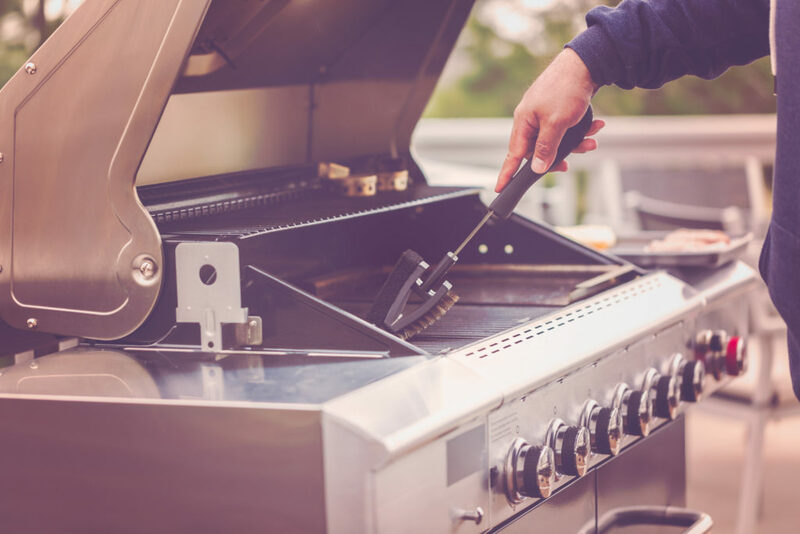 Start the season off with a totally clean barbecue. Get a degreaser and a wire brush. Scrub away until all of the grease and charcoal buildup is removed. A clean barbecue makes everything taste better, and cook better too. It will also preserve your grill and help it last longer. Clean your front door with a towel and some soapy water. Use a second towel to dry it off and remove any soap. The front door is the first thing you see when you enter your house, so it’s important for it to be clean. Spring is the perfect time to place an outdoor welcome matt down! During the spring and summer, the deck or patio is where you and your family will probably spend most of your time. If you have a wooden deck, it can collect fungus or mildew stains, or weather-beaten patches. Start by pressure washing the deck to remove any debris and dirt that have accumulated the past few months. After that, if your deck still isn’t looking great, you could consider re-staining it. Look for a stain that has a protective finish that can repel water and UV rays. If you have dogs or even outdoor cats, you’ll know that their excrements can quickly add up if you don’t tend to them regularly. This is especially true if you don’t have a large yard area. Wear some old shoes and walk around your entire yard scooping and shoveling up anything from them that you come across. Go around your house cleaning any lanterns and light fixtures. Chances are there will be a collection of dead bugs in there, so remove them. Wash the glass bulb with soap and water, and then let it fully dry off before securing it back into place. If any bulbs are burnt out and need replacing, this is the perfect time to do so. … Now let’s move on to the second part of our spring cleaning list! Now that the warmer weather is here, it’s time to clean a pool if you have one and get it ready for use. First, uncover it and use a net with a long pole handle to remove any debris and items floating in the water. Once you’ve removed all the large items from the water, it’s important to remember to empty your filter baskets before you turn the filter on. Weather can really take a toll on a paint job. If you notice that you have areas on your property where the paint is cracked and peeling, you could apply a fresh coat of paint. Maybe the shutters need some paint re-applied to them, or your garage or front door. If you have a painted fence, it might be a good idea to repaint that too. If you have kids, it’s a fun way to get them involved with spring cleaning! Before you begin to organize the garage, it’s important to think about the layout. Maybe there’s a workshop area in one corner and storage in another. Lack of storage space and organization are usually the biggest problems. Install cabinets, racks, and shelves to create more space in there. Use any extra boxes or old storage containers to organize items. For items that don’t fit into any specific category, create a “junk box” where you can store all those random items. While going through and organizing the garage, have a box dedicated to unused items that you can donate/throw away to free up space. Once you’re done with your spring cleaning list, it might be time to buy some new plants. However, you can’t do that if you have dirty terra cotta pots. These pots need to be properly cleaned so they’ll last you for years. Disinfect your pots to get rid of any soil residue that could carry diseases that are harmful to new plantings. Scrub both the outsides and insides with water and a stiff brush. To prevent mold, let them fully air dry in the sun. Hopefully, this outdoor spring cleaning tips gave you some ideas about what you need to work on for your own property. Here is a recap of everything mentioned in one large outdoor spring cleaning list.